Honey has been used since the time of the ancient Greeks and Egyptians to treat everything from wounds to insect bites. Drinking warm lemon water mixed with honey is a time-honored way to soothe a sore throat. But Honey has used as a natural remedy for cough suppressant, too. 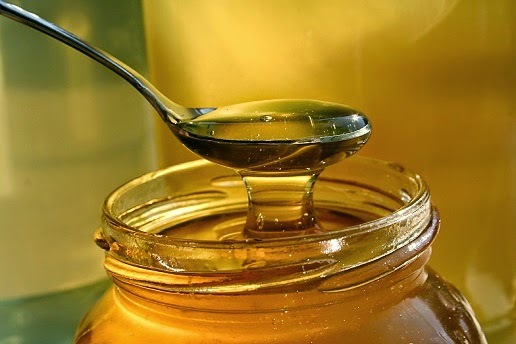 Honey has known antibacterial properties that can rid your body from harmful bacteria causing the cough. Take 1 tablespoon of honey(organic and raw honey)1-3 times daily. Take immediately before bed if cough is disrupting your sleep. For children, you can give 1 tablespoon of honey 1-3 times daily. Note:-Parents are advised not to give honey to any child under the age of 2 year; infants younger than that are at risk for botulism(Botulism is a rare but serious illness caused by Clostridium botulinum bacteria. The bacteria may enter the body through wounds, or they may live in improperly canned or preserved food) from honey.